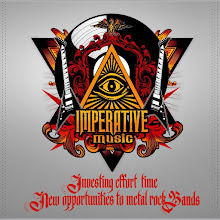 Imperative Music Agency Compilation: These Bands merit your support and attention! ALICE IN HELL (Japan), INFACT (Luxembourg), CAVERA (Brazil), AS DO THEY FALL (Brazil), NIHILO (Switzerland), STATUE OF DEMUR (Canada), DARCRY (Japan), DEATH CHAOS (Brazil), THE HOLY PARIAH (USA), TRIBAL (Brazil), HIDE BOUND (Japan), PHANTASMAL (USA), BASTTARDOS (Brazil), METANIUM (USA), THE WILD CHILD (Italy), ARMED CLOUD (The Netherlands), EDUARDO LIRA (Brazil), GODVLAD (Portugal). Made in USA, Booklet with 4 pages, Inlay-card and CD. Death Metal - Thrash Metal - Heavy Metal !!! Awesome Metal Bands Around The World! 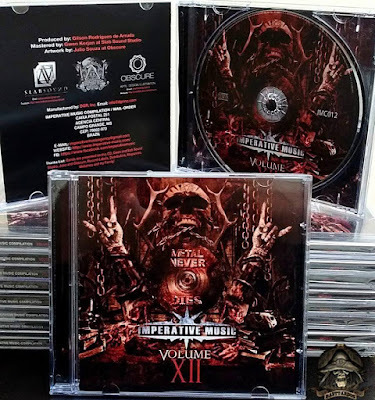 Support Metal Scene! These Bands merit your support and attention! Click "like" and "share" to spread the word in help for these bands, thanks! You can get this compilation directly with bands.